The pub date for Chronicle of the Murdered House by Lúcio Cardoso, which is translated from the Portuguese by Margaret Jull Costa and Robin Patterson, with a biographical note from Ben Moser officially came out on Tuesday, December 13th. To celebrate the release of this Brazilian masterpiece, we’ll be running a series of pieces over the rest of this week, including an interview with the translators, an excerpt, a press release, and part of Ben Moser’s piece. Although the book has only been out for a couple days, it has already received a number of quality mentions, three of which are detailed below. Lúcio Cardoso’s lurid and voluminous masterpiece Chronicle of the Murdered House follows the unraveling of the Meneses family, a once-proud Brazilian clan undone by internal mistrust. [. . .] Pages pass quickly under the influence of heady intrigue as Nina battles for her rightful place on her husband’s estate and plans punishments for those who undermined her. Even at her most cruel, she comes across as complex: a fading beauty, wronged, furious, pathetic, and ferocious, by turns. Questions are raised: can lines be crossed beyond which forgiveness is not possible? Can love survive severe betrayals? What is the true meaning of absolution? Cardoso’s novel is complex, gorgeous, and heartbreaking, well justifying its place in Brazil’s literary canon. Over the sixteen+ years I’ve worked in publishing, until yesterday, none of our books had ever been reviewed in The Onion’s A.V. Club (not without great effort on our part, since this seems like a good fit for our type of book). And not only was Chronicle of a Murdered House reviewed by the A.V. Club, it was given a straight A rating! 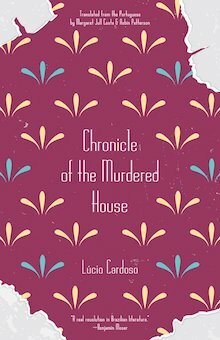 Like its protagonist—or, depending on which account herein you believe, antagonist—Lúcio Cardoso’s Chronicle Of The Murdered House has reemerged from seclusion. First published in 1959, it was a postmodernist work that veered from the nationalist literature that had preceded it. Where his forebears sought to represent their country’s social consciousness, Cardoso narrowed his focus to the moral and financial decline of the fictional Meneses, a once-grand family relegated to the Brazilian countryside. [. . .] Cardoso was an openly gay man, and the cross-dressing Timóteo is both his stand-in and the avatar for a social order already past its expiration date in the early 20th century. As the novel makes its way to a conclusion both thundering and mewling, Timóteo retreats once more, symbolizing a discussion shelved by Cardoso’s death in 1968. But the gorgeous, deviant story he was able to tell in Chronicle’s pages became one of the hallmarks of Brazilian literature, prompting this English rendition decades later. The family’s secrets, many revolving around the arrival of Valdo’s seductive wife Nina, are revealed slowly through a series of documents – diaries, letters, confessions, and reports from the town doctor, pharmacist and priest. It’s a sensuous, bewitching tale, suspenseful to the last page. And I’m certain there will be many more to come . . .